This is one of the most commonly reproduced misattributed portraits. 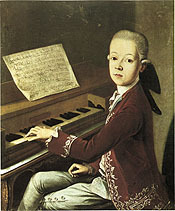 The boy is actually a young Count Karl Firmian, who was a childhood friend of Mozart. Note the keyboard’s odd assortment of black keys.